We've had it. Enough is enough. We want to step down and let pictures do the talking. We hope that you're convinced at the end of this short little piece. 1. Life in Delhi is uneventful and boring. 2. 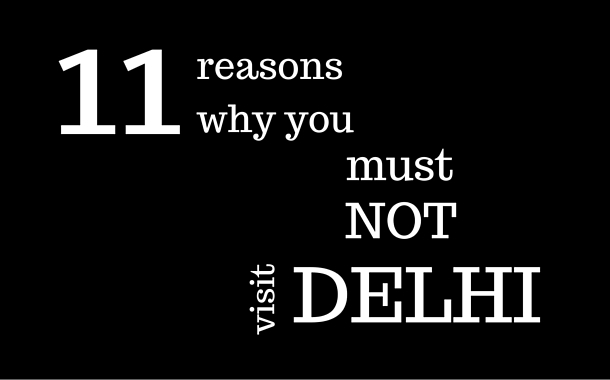 Delhi food is bland and ordinary. 4. It is a Concrete Jungle. 5. For those who have lost their lives fighting in war, such is the place they rest in. 6. Women aren't allowed to step out of the house. 7. There's no scope for meeting new people if you're a social butterfly. 8. If you're still thinking of travelling to Delhi, say goodbye to a peaceful sleep. 9. If you're an avid photographer, Delhi will be the death of your creativity. 10. People hate sharing here. 11. Strangers are dangerous people to talk to in Delhi. Singing with them is out of the question. PS: Sarcasm is a tool well understood only by the gifted. The author does not intend to hurt the sentiments of any caste, gender, creed, or piece of work.